So at Superheroes Central we thought long and hard about whether we would add some of the best authentic and realistic Deadpool costumes for men that we could find, for obvious reasons, he hasn’t always been a good guy, and well, we are Superheroes Central not Supervillains Central. But in the end we had to take three factors into consideration, firstly everyone loves the merc with a mouth, whether it’s his irreverent attitude, his wise cracking one liners or the fact he knows that none of this is real(he is well aware that he is only a comic book character), secondly he actually has tried very hard to go straight and help the good guys after his less then savoury beginnings, so we thought we’d cut him some slack, and thirdly because his black and red costume is just one of the coolest superhero(we use that term loosely) costumes out there, it looks amazing, and as one of the more adult orientated characters out there Deadpool is a perfect costume for men. 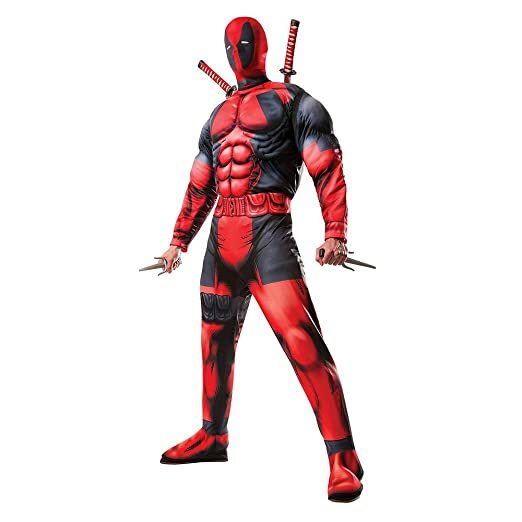 So now that know more about the merc with a mouth, let’s talk about some of the best Deadpool costumes for sale suitable for the adults that we have found, at Superheroes Central there are few things we take into consideration when compiling items for review in our articles, firstly the price point and functionality of the said item, in this case costumes. We always like to have a cheap and quick and easy costume for sale, and in this case it’s an awesome Deadpool T-shirt costume although a mask will have to be bought separate. Other factors we consider include products that have received positive reviews from other costumers and of course appearance, it definitely has to look cool(fortunately Deadpool’s costume is one of the coolest out there). Also included were authentic and realistic Deadpool costumes that were awesome looking and of a high enough quality that they were perfect for cosplay costumes for the adults we could find for sale and hopefully there is something for sale that would be perfect for you. First up we have got what is clearly the best and most authentic Deadpool cosplay costume for sale out there, just look at it. At Superheroes Central we try and provide something for everyone and in this case it’s something for the serious Deadpool fan, who when it comes to dressing as there favourite anti-hero quality and realism mean more than price, because yes this costume is a serious investment, but for those who enjoy cosplaying, well worth it. This Black red costume is from synthetic leather and modelled on Ryan Reynold’s costume that he wore in the smash hit film Deadpool which allowed the uninitiated to enjoy the merc with a mouth as much as long time fans. The actual costume is of a very high quality and comes in a variety of adult sizes but can be made to custom measurements, the parts of the costume are mask, gloves, jacket, pants, boots and utility belt with pouches. This costume is a little different as it can be ordered in three different packages. Package 1 includes: jacket, pants, gloves and utility belt. Package 2 includes: mask, jacket, pants, gloves and utility belt. The third and final package includes: mask, jacket, pants, gloves, boots and utility belt. These different options can be accessed via the “colour” options when ordering. It really is a great starting point for the most authentic and realistic Deadpool costume for fans of the movie and people serious about cosplay, you can add this higher quality twin katana chest harness we linked or even add tactical holsters for the legs both left and right. Bought and reviewed by lots people there were far more satisfied customers than not, so why not be one of them and have some fun. 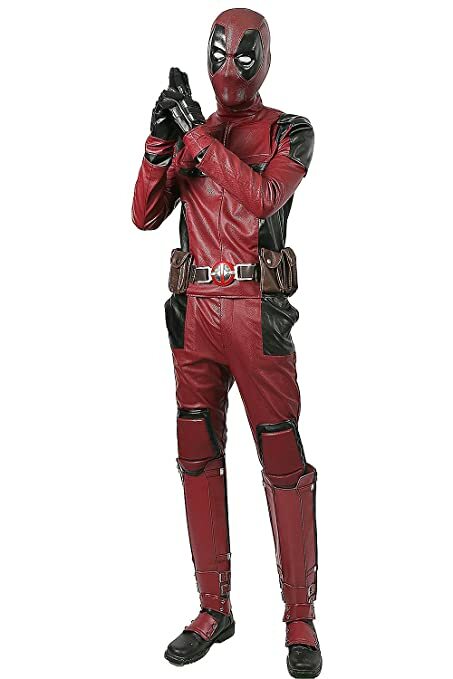 Continuing the theme of realistic Deadpool costumes for sale we have another great red and black jumpsuit with attached boot tops, with separate mask and again it has fibre filled arms and chest giving you that extra musculature that really helps pull these costumes off. Again the print design and quality and very, and although we really like both this costume and the previous one, one advantage that we thought this one had, was that it would be a better starting point to more detailed costume, what we mean is that the belt and leg pouches are black and red and no printed chest straps for the twin katanas that Deadpool uses, so we thought if you bought a chest harness and swords separate than that would really upgrade your costume to the next level, other upgrades we thought of included a realistic Deadpool utility belt and maybe even a utility belt and leg pouches ensemble that we found, the point there are so many ways you could upgrade this costume, and we thought this one was this is the best and most realistic of the Deadpool costumes for men who are fans of the version from the comics. And again like the previous costume, it is really great for the price point, and has lots of great reviews and an even higher approval rating from men who have bought the costume. 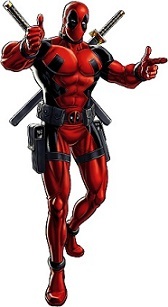 Next up we an authentic Deadpool costume for sale, which really looks the part, it’s red black polyester jumpsuit with attached boot tops, additionally the arms and chest being padded with fibres to give you that buff look that every real superhero needs, it also comes with a belt and mask. The print on this costume is fantastic and really does resembles the comic version of Deadpool, a well as having and has some real depth. so much so, that some features will need a second glance to see that they in fact only printed on, which is awesome for superhero costume at this price point. 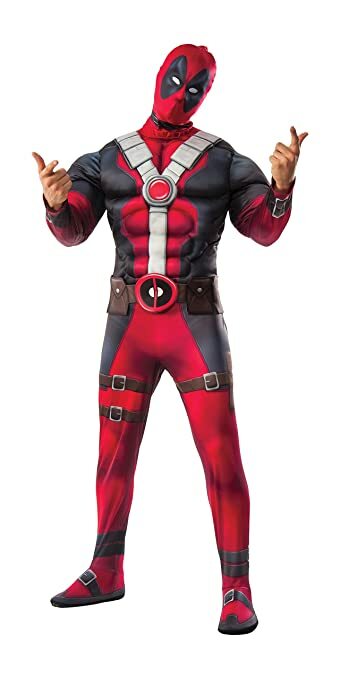 As we said earlier we try and pick stuff that people love, and people love this authentic looking adult Deadpool costume giving it a high approval a rating with very few complaints. 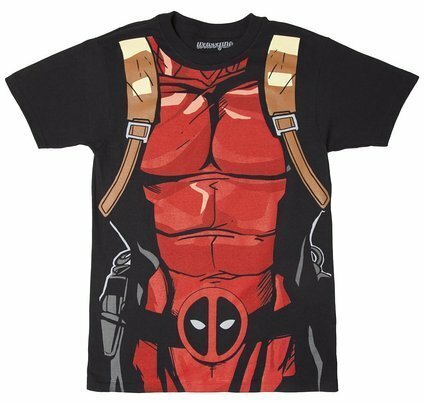 This cheap Deadpool T-shirt costume is a perfect starting point for a quick and easy solution for a costume in a pinch, just add a low cost adult sized Deadpool mask and your all ready to go and have some fun dressed as everyone’s favourite merc. This red and black shirt is made from cotton and has a really cool Deadpool costume print on it which makes it look like you’ve got abs of steel, this particular shirt not only looks great, but heaps of people have bought it and been very impressed, even though it’s pretty cheap it’s a quality item great for casual wear as well. If you have ever wonder what other costumes our favourite merc might have ended up wearing, then wonder no more because in this cool little You Tube clip someone has put together a some of the cooler and more outrageous(remember old Wade is insane), so have a look if you are curious, but we just gotta say number five was definitely our favourite(apart from his classic costume of course). Have fun. Just who is the real Deadpool? The truth is that no one knows for sure, including himself. That is one of the many challenges about this awesome character, he’s insane, he knows it, and we know it. First created by Rob Liefeld and Fabian Nicieza and appearing in New Mutants #98 in 1991, there have been many origin stories that he himself has related, and that he may actually believe them, but the truth is, even he doesn’t know for sure. One story has him as teen runaway named Wade W. Wilson who enlists in the army and despite finding out that yes he’s very good at killing people, and yes he enjoys it , he really doesn’t fit in the in the army and he’s dishonourably discharged, he then then decides to become a mercenary. Moving to Canada he then takes a job to assassinate a man named Wade T. Wilson, and in the course of this job he accidently kills the target’s wife, Mercedes, while the target himself flees, Deadpool always regrets this and takes Wade T. Wilson’s Canadian identity(which will come in handy later). Yet Deadpool has memories of a mother dying of cancer, a father who beat him, another father who was killed leaving a bar, or he may been forced to kill his entire family under mind control, in fact his true name may not have even been Wade Wilson, W or T. There is just simply no way to know at this point in time due to Deadpool’s instability and insanity. But other facets of his life are clearer for example we know he was born an ordinary human, and after getting terminal cancer enlisted in an offshoot of the Canadian weapon X program(this is where that bogus Canadian citizenship really came in handy), which is a program where they try to induce mutant abilities in ordinary people via horrific and painful therapies, the treatment is based on Wolverine’s healing factor, and it is successful, which Wade discovers after being killed by one the sadistic guards, Ajax. But his new found abilities are not without cost, because yes he has a powerful mutant healing factor now, but he is also still dying of cancer, and the resulting conflicting condition results in horrific disfigurement. Donning a concealing full length red and black jumpsuit and mask costume Wade accepts his new reality and returns to life as mercenary working for numerous bad guys, killing lots of innocent people, and fighting heroes like the Hulk(it didn’t turn out too well), before turning over a new leaf and trying to become one the good guys(and only occasionally killing innocent people) He even Joined the X-men fighting alongside other mutants such as Storm, Cyclops and Colossus. He has also worked alongside notable Avengers like Captain America and Spiderman. Deadpool’s abilities include a powerful healing factor that is driven by will power(he has once regenerated himself from a single hand) he is also resistant to telepathy, whether this due to mental instability or a side effect of his bodies constant regeneration is unclear, he also posses superhuman levels of speed, endurance, reflexes and strength(although not a powerhouse, he is far stronger than the average human), and he is also a skilled martial artists and marksmen able to defeat highly trained foes with ease. His main weapons are twin katanas and firearms(of which he is thought to have an unlimited supply of ammo which he keeps in the numerous pouches on his costume which are always full due to his knowledge that in fact, it’s just a comic) and in the past he has had access to teleportation technology, which he quit using because it made things too easy.